In the following page I hope to present some of my experiences with direct head to head comparisons between the technologies behind Visante omni, Pentacam, and the Cirrus OCT's anterior segment capabilities. 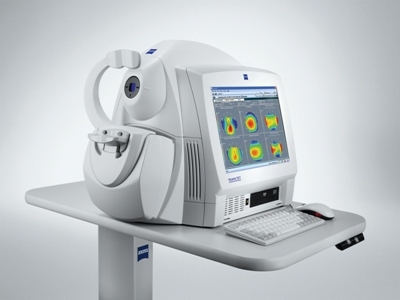 In review, the Visante omni, is a composition of 2 different machines, the ATLAS placido disc based computerized corneal topographic system, and the Visante Anterior Segment OCT. The ATLAS uses a placido disc to image the anterior corneal curvatures. The Visante uses 1310nm light to provide imaging of the anterior segment. The Visante can do a pachymetric mapping of the cornea and when combined with the ATLAS anterior curvature data, the posterior corneal curvature can be calculated. I am presenting information from Pentacam here, because that is the system I have used. I have nothing against the machine, the maker, or anyone. Simply, the Scheimpflug system used happened to be the most commonly used system, the Pentacam. The Pentacam is a rotating drum Scheimpflug system using the visible blue light 475nm. There is a center slit beam that rotates with a peripheral camera placed perpendicular to the axis of the slit beam. The camera and the beam then rotates around the eye and takes serial images from an angle. Through ray tracing then images are reconstructed and the posterior curvature is calculated. 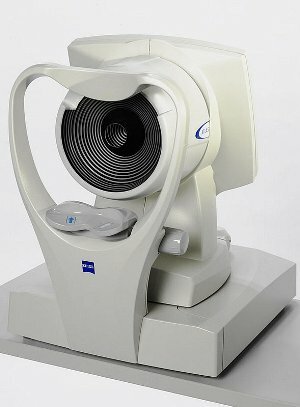 The Cirrus OCT is a spectral domain 840nm light system that has been adapted to do anterior segment imaging as well. The capacity and the limitation of the system are also explored. Please follow the sub-tabs under the heading above to see the many cases I am presenting. I would love to hear your comments and cases if you would like to me to present. Email me at DrAsh@ModestoEyeCenter.com. The following are cases of same patients that I examined with all the different instruments. Some of cases just simply present basic concepts. Case of Hard Contact Lens as seen by the 1310 nm, vs. 840 nm, vs. 475 nm light source. Also it is important to keep in mind the size of the image produced by each machine! Case of Pseudophakic Bullous Keratopathy as seen by Visante vs. Pentacam Scheimpflug. Case of Epithelial Ingrowth as seen by Visante vs. Cirrus OCT.
Case of immediately Post DSAEK patient with Air in Anterior Chamber. Visante, Pentacam and the Cirrus all behave differently towards this case! Case of a patient with Verisyse/Artisan phakic IOL in her eyes. Visante, Pentacam and the Cirrus have different views. Case of a patient with Keratoconus. Both Visante omni and Pentacam perform well. The key point being this a case of native ectasia. Other cases of induced ectasia present differently. Case of a patient with Post Myopic iLASIK surgery. Visante omni and the Pentacam are evaluated head to head. Case of a patient with Post LASIK Ectasia. Visante omni and the Pentacam are compared head to head.